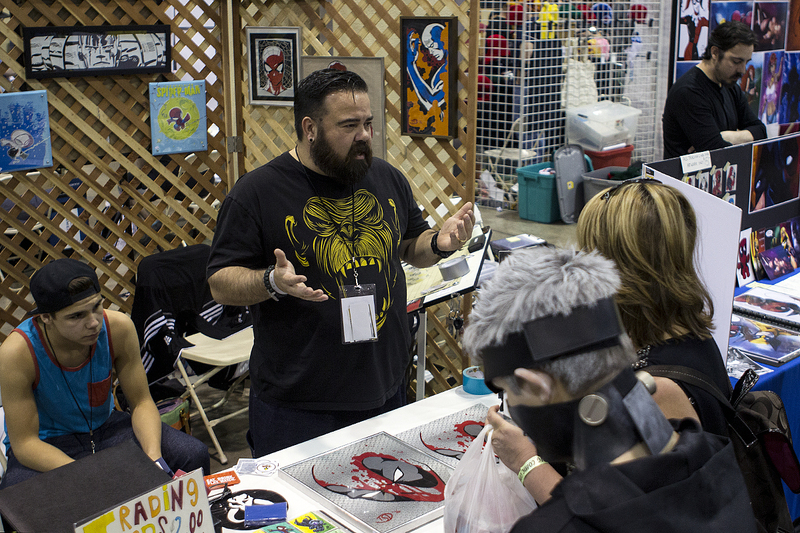 Micah Garcia pitches his duct tape artwork to convention attendee as his son, Christian, sits next to him at Amazing Arizona Comic Con in Phoenix, Arizona on February 14. AACC was Garcia’s first convention as an exhibitor. “It’s all duct tape,” a voice calls out as groups of people pass by The Stuck Duck’s booth in Artist Alley at Amazing Arizona Comic Con in Phoenix, Arizona. The voice belongs to one of Micah Garcia’s sons, who is pointing out a piece of Deadpool artwork that sits on the table for people to pick up and touch. Garcia is usually seen working on pieces of art at his booth, while his sons help him attract the attention of attendees who are walking through the hall. AACC, which was held from February 12-14, was Garcia’s first show as an exhibitor. Being from Chandler, Arizona, Garcia thought the local convention would be a good fit for his first show. Daryl, who goes by the name Ducky D, said he was happy to have Garcia at the show. Ducky D said that he likes the style that Garcia that bases his art on. When it comes to his style, Garcia’s work is based on classic comic book style characters. In a testament to how well the classic comic book art lends itself to duct tape, people can’t tell at first glance that Garcia’s art is made of duct tape. “I like the challenge of actually making the duct tape look like a piece of printed ink by using transparent duct tape on top of my colors and doing things like that to make them look more like the comic book,” Garcia said. “I thought it was actual paint,” Black said. Garcia said he had mixed, but mostly positive, feedback overall. 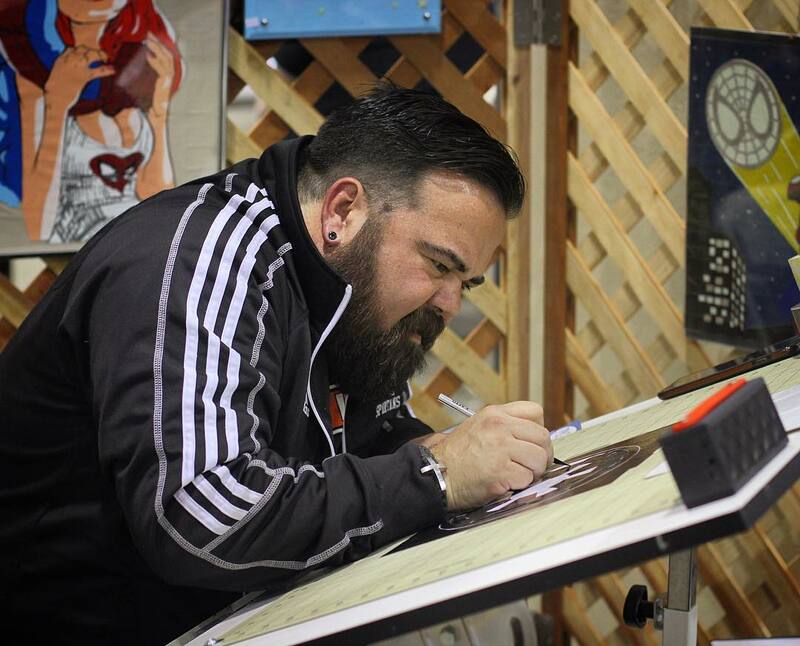 Rather than making sales, Garcia went in to the convention just to get his work out for the first time. Garcia said he wants to work up to Phoenix Comicon, but really enjoyed AACC. “I’ve loved it, I’m coming back again next year, it’s been amazing,” Garcia said. Overall, Garcia enjoyed his experience.